So much happened today that I'm still trying to understand what really went on. Started last night with the tent by tent briefing from Jangbu, no mess tent space on this tiny rocky outcrop in the middle of a glacier. He told us we would be getting woken up at 12.30 am and be leaving around 1.30, and to put on all our clothes because it would be very cold. 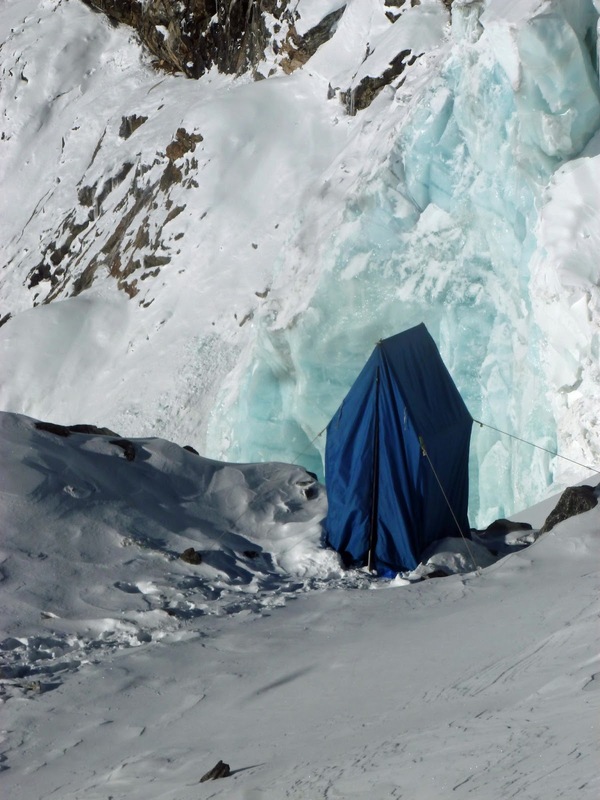 We had already been warned that nature can be savage in these parts when a lump of ice broke away from the glacier sending a large bang around the camp site. It then got dramatically worse. At about 8pm the wind started to blow, really blow, gale force, and I still don't understand how the tents - especially the lofty toilet tent - stayed intact. Later the wind dropped and after a short sleep intermission I lay in my sleeping bag listening and watching the most sustained thunder storm I have ever witnessed. The tent shone orange but even with my eyes shut the pyrotechnics penetrated. Needless to say no one came to get us up at 12.30 am and the storm continued until about 3am, after which point the wind came back. No summit attempt in this storm. Had no idea what all this meant although I did know that snow was involved as someone had been around in the night to knock large accumulations off my tent. Got up early as the sun was trying to make progress in an otherwise cloudy sky and I was hoping to spot some of the six 8,000 metre peaks you see from this vantage point. Jungba was reviewing options in light of the fact that there had been 2 feet of snow in the night. Given the difficulty of spotting the crevasse, both going up or down had its difficulties. He also had a problem with the porters who he knew would be reluctant to come up to collect the gear. In the end he concluded that going down was the best approach and believed he could get one of the remaining kitchen porters to take the sleeping bags if we could carry the rest of our stuff in our day bags. In line with this plan we set about repacking when Jangbu changed his mind. The weather had got better and we got our first sight of a big beast in the form of Kanchenjunga. He felt that at least we should go for a walk and then review our options once we had had a proper look. We agreed instantly and disappeared to repack and get our climbing gear on. I think it was the sight of a couple of us getting roped up and memories of yesterday's ordeal that turned Mark and Big John off the idea of a voluntary walk. Anyway the team was down to four with Jungba and Lhakpa when we set off. The snow on the glacier varied in depth from zero where the wind had blown the snow away to the seemly infinite where it was longer than my walking poles. Two and three feet was common, zero rare but very welcome, and three feet to infinite the norm. Moving through snow like this is incredibly hard work. The nearer you are to the front the harder it is. You're either working at breaking the trail - making the trail easier for the person behind - or, where the snow is deeper, providing a series of compacted foot steps capable of sustaining the weight of those that follow. 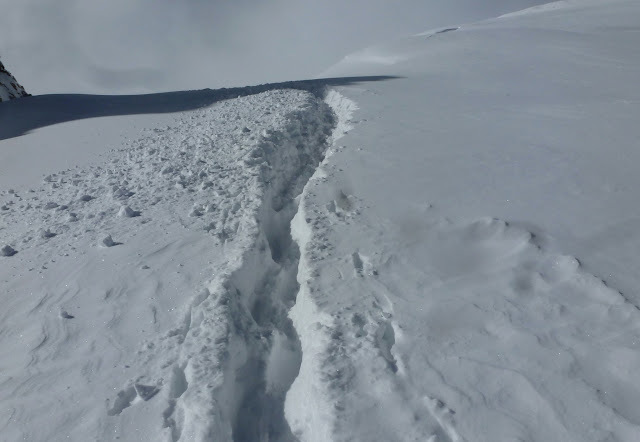 In addition to breaking the trail the lead walker has to avoid obvious threats in particular crevasses. I quickly discovered that these were not part of an over - active Nepalese imagination when the ground Lhakpa had just walked on collapsed as I tried to cross it. It was a proper crevasse, a New York crevasse as Jangbu describes them, one with a lot underground. The top though was narrow and although my legs and body disappeared my arms, shoulders and walking sticks remained on the surface. It was a shock but I'm not sure how dangerous it was - I was roped to the others and as I dropped I was able to stab my sticks into the snow and before I really knew it I was out the crevasse, lying on my back and safe. 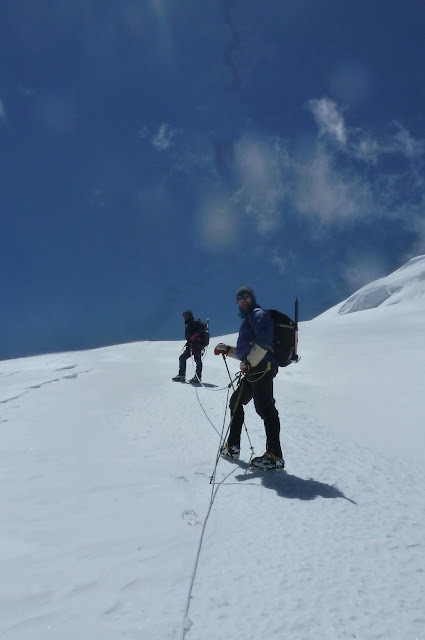 With the effort of breaking the trail and the search for crevasses, progress was slow but after a couple of hours Jangbu said that he felt we should aim for the top and that we should be able to do it in three hours. I think three hours was supposed to be encouraging but given that we were already tired it didn't really help. Still we did agree with Jangbu that there would definitely be no energy tomorrow for a second attempt. One person who clearly didn't like the plan was Lhakpa, veteran of 14 Mera Peaks summits, who had never experienced anything like this volume of snow before and was clearly totally knackered from leading on the trail breaking role. Jangbu then took on an even larger share of the job, hard on Cerrie who was attached to him by rope, but even he struggled. Jangbu then got us doing shifts, each taking turns at trailbreaking. This worked well almost to the top of the main ridge. The last 10 metres or so of snow was so deep that we seemed to be digging an ever larger trench rather than actually gaining altitude. A huge physical effort, almost running at the hill, from Jangbu eventually secured a trail and got us to the top - where we were confronted by two substantial and dangerous crevasses. 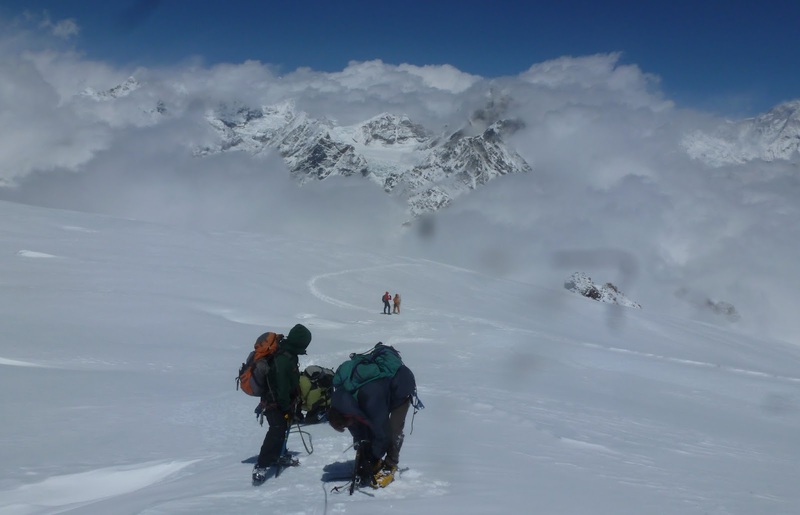 It was now snowing, visibility was low, and despite his determination to get us to summit Jangbu suggested that we call it a day. 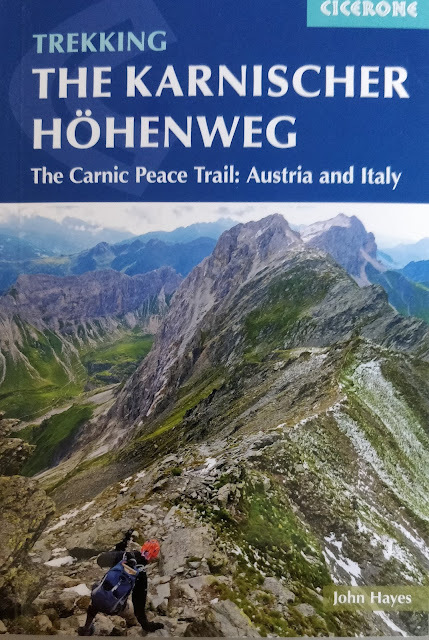 After a bit of discussion and an objection from Chris (which, to the rest of us felt like a bit of a rush of blood to the head), we all turned round and headed down the hill. Jangbu did say that in the Autumn he thinks these crevasses are crossed using ladders and in the spring the only option is to fix ropes. I'm not a mountaineer but the rope option didn't seem very appealing . 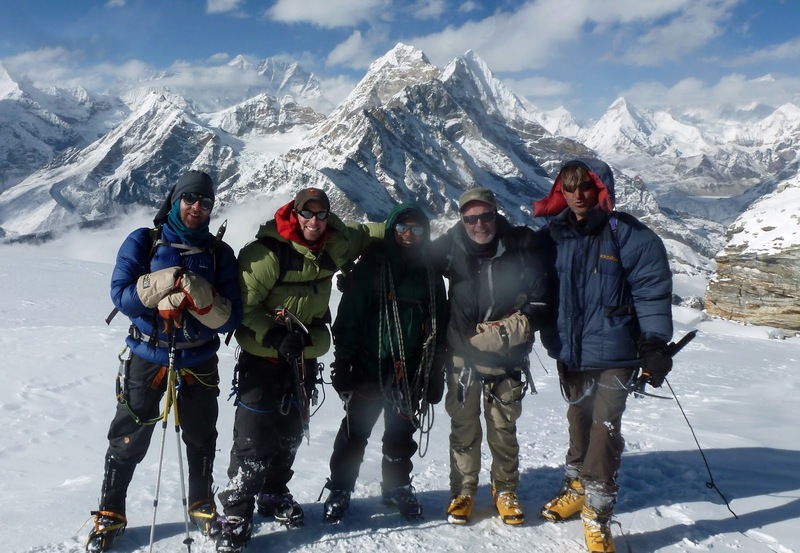 As far as I was concerned, although we didn't summit we had done incredibly well. We stopped at 6225 metres, just over 200 metres from the top and well over my 6,000 target. We had also seen six of the world's fourteen 8,000 metre peaks. Coming down was a lot faster but, drained of energy, it was a lot harder work than my usual mad downhill rushes. Felt dead when we climbed into the tent and ate the packed lunch designed to take us down the hill rather than up. A Snickers bar and then an unexpected and reviving bowl of soup helped further, but with so much spinning around in my head sleep did not come easily. Very well John. Accomplished and good back. Also the esplendid pictures and the whole scenery to be on your mind forever.